This Wellworth dual-flush toilet tank combines water savings with powerful flush performance. An innovative two-tone flush lever offers the choice of 1.1 or 1.6 gallons per flush; the dual-flush lever is located on the side of the tank like a traditional toilet, leaving the top free for storage. The high-efficiency 1.1-gallon flush reduces water use by more than 30 percent over the 1.6-gallon mode, which adds up to potential water savings of more than 4,000 gallons per toilet, per year. Left-hand nested trip lever offers a choice of 1.1 or 1.6 gallons per flush (gpf). Combines with the K-4197 or K-4198 bowl to create a complete K-3987 or K-3988 Wellworth toilet. Combines with the K-4199 bowl to create a complete K-3989 Highline toilet. 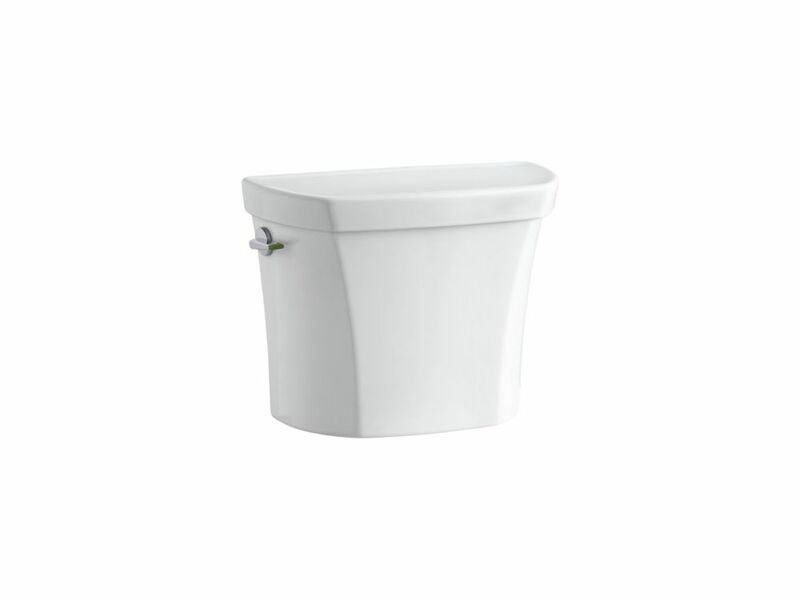 Wellworth Dual Flush Toilet Tank Only In White This Wellworth dual-flush toilet tank combines water savings with powerful flush performance. An innovative two-tone flush lever offers the choice of 1.1 or 1.6 gallons per flush; the dual-flush lever is located on the side of the tank like a traditional toilet, leaving the top free for storage. The high-efficiency 1.1-gallon flush reduces water use by more than 30 percent over the 1.6-gallon mode, which adds up to potential water savings of more than 4,000 gallons per toilet, per year. Wellworth Dual Flush Toilet Tank Only In White is rated 4.8 out of 5 by 5. Rated 4 out of 5 by Nathan from Good toilet for the price. High quality. ... Good toilet for the price. High quality. Rated 5 out of 5 by magoo from Fantastic choice!! The dual option saves water and it's very adjustable for the water level, etc... Fantastic choice!! The dual option saves water and it's very adjustable for the water level, etc. Very glad I made this purchase! Rated 5 out of 5 by Gi from Really pretty tank. Liked the flush system. Great for small space. Love the clean lines on it. Really pretty tank. Liked the flush system. Great for small space. Love the clean lines on it. Rated 5 out of 5 by DK from Works perfectly...but then...'tis a Kohler!!! Works perfectly...but then...'tis a Kohler!!! Rated 5 out of 5 by HomeDepotCustomer from Kohler makes excellent product! Delivery was fast and installation... Kohler makes excellent product! Delivery was fast and installation was a snap.